Summary: KDE, one of the leading Linux desktops, is taking dead aim at Android and Apple’s iOS on smartphones and tablets. If another group was trying to take on Android and Apple’s iOS on smartphones and tablets, I’d dismiss them. RIM, BlackBerry’s parent company, is having a heck of a time getting anyone to buy into PlayBook and while HP TouchPad users loved it,HP killed the TouchPad after only a few weeks. So, why should anyone think that KDE, makers of one of the two most popular Linux desktops, should stand a chance with Plasma Active? Well, because KDE has a long history of delivering the goods with minimal resources. An interface that adapts as users change Activities. “The first release of Plasma Active fully focuses on tablet computers. 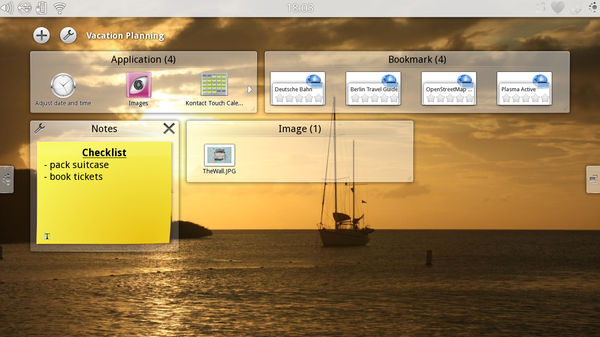 Plasma Active Tablet’s user experience is designed around the web, social networks and multimedia content.” Today, Plasma Active runs on MeeGo and the openSUSE-based Balsam Professional (German language site). There are also OS images for Intel-based tablets, and package builds for ARM and x86 platforms. The group is working flashable images for ARM platforms. The interface will also run on Oracle’s VirtualBox virtual machine. If you want to try it you can find downloads and instructions at the Plasma Active Installation page. Kügler also told me that they “have started investigating Tizen, [Intel and the Linux Foundations' proposed replacement for MeeGo] but at this point, there is too little information out, and too many unknowns. We do see Tizen as a potential and likely target platform, but before Intel and Samsung release an SDK, our hands are tied. It’s not stopping us, since in the meantime, we can still run our stuff on MeeGo and Balsam, and we are investigating, together with the Mer team [Another mobile Linux operating system] how to get Plasma Active onto Mer. To that, I might add that unlike other such mobile projects, KDE starts with a large number of open-source applications that already run with it. That’s an advantage that neither RIM nor HP had. Personally, it’s hard for me to see a competitor to Android or iOS getting traction, but I’ve learned over the years not to bet against the KDE team.